I’ve been suffering from an ever growing fatigue issue for 4 years. The cause was something rather unexpected, and I did recover. Since there are so many people suffering from a fatigue issue, often catalogued as chronic fatigue syndrome, and so little seems to be known, I decided to share my experience. This is my story, this is not medical advice. But if you do suffer from a severe fatigue or chronic fatigue syndrome, you might check my story and discuss it with your doctor(s). A few months later, I had an appointment with the doctor that treats me for apnea. I have been diagnosed with apnea in 2004 and since then I’ve been wearing an MRA-device (Mandibular repositioning appliance). She suggested to turn the screw a little bit more, but that didn’t help. In September 2013, one year after the fatigue started, I applied for a sleep examination in one of the leading sleep clinics in the neighborhood. There was a long waiting period, the exam took place early February 2014. The result was that I had to take another one, in July 2014: I had worn my MRA, which I shouldn’t have done (nobody told me that upfront…). And my apnea score was ‘only’ 17 (so 17 times/hour my breathing stopped), which was not enough to move to the stronger equipment, the CPAP-device. During a small test, it was also revealed that I’m allergic to mites, since then I’ve been taken a nasal spray for that. During that period it became more and more difficult for me to work full time. On many occasions I had to return home to go to sleep. I also had ‘micro sleeps’ while driving my car. I had holes in my memory. I had problems finding the right words (or better: I knew the words, they were in my brain, but I couldn’t get myself to express them). I couldn’t drive my car for one hour. And even though I slept 10 to 12 hours/night, I was exhausted, almost every day. In December 2014, I had to go back to the sleep clinic for a routine check, with another doctor. Since he saw in the report I also suffered from ‘restless legs syndrome’ , he suggested to start special medication for that. Special medication since you have to apply for that… And it didn’t help. I stopped after a week: I had more negative effects than positive ones. After a few consults he, reluctantly, said he could not help me anymore. He had no more ideas. And he referred me to the psychologist from the sleep clinic… That’s the way it goes: if they can’t find anything physical, it must be in your mind. She was rather busy, so the appointment was only in May 2015. In April 2015, I had another appointment with the first doctor in the sleep clinic, the one that said that in my case it could take up to 6 months before I could see progress. Those 6 months had passed, without any progress, now he was also out of ideas. At that moment I stopped working, I went in to sick-leave. I couldn’t function normal anymore. I had been fighting the fatigue already for a long time, I couldn’t go on like that anymore. But one advice from her was a good one: when looking at my blood analysis and knowing that I had restless legs syndrome, she suggested to take extra iron and vitamins B12 and B6, since these levels were rather low. Not below the normal threshold, but still quit low. And this indeed helped resolving the restless legs syndrome. My GP referred me then to an older doctor, who is also an engineer by education. I met him in July 2015 for a thorough examination. And for the first time, I had a good feeling about my problem. His conclusion: my body produces way too much lactic acid (4 to 5 times the normal values) and because my sleep quality is poor, the lactic acid isn’t broken down during my sleep, preventing my muscles to regenerate. A possible cause might have been my thyroid, which was very large (after taking medication for some time, it shrank to normal proportions). But he also referred met to an ear/nose/throat specialist (ENT) in another hospital, he wasn’t that fond of the first hospital where I had my sleep exam. The sleep endoscopy revealed that everything that can rattle, will rattle: nose, throat, palate. Hence my strong apnea. There were two possibilities, but I opted for a combined surgery: septoplasty, to straighten my septum, and somnoplasty, to treat the apnea. This surgery was done at the end of November 2015. Just before the surgery, I had bought a Microsoft Band 2, a smart watch that has a very good sleep tracking. Since that day, I’ve been wearing and using it every day. This was a really good investment, I can recommend it to everybody with a fatigue issue! Really!!! This screenshot shows a ‘bad’ night. 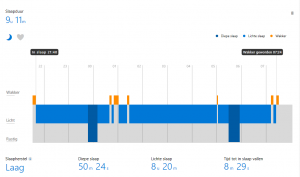 Dark blue is the deep sleep, light blue light sleep and orange means time awake. 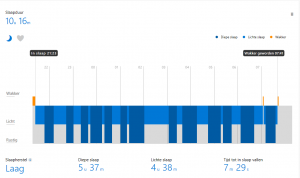 And this is my best night ever… This amount of deep sleep happened only twice during the 10 months I’ve been using the Microsoft Band 2. When I returned home, my sleep quality was very good and I really started to recover. For about 3 to 4 weeks, the amount of deep sleep was around 3 hours, the amount that seems to be the right one for me (yours can be different!). But after that, the amount of deep sleep went down, returning to the level before the surgery… And the fatigue also returned, very badly. Since I had to return to the ENT for follow up, I discussed this with him. And I suggested that it might have to do with the nose bleeding, the balloon that was blown up inside my nose: could it be that this pushed my nasal passage wide open, getting a better air flow and then gradually returning to the normal position? The ENT was not really convinced, but he did not reject it either. At a certain point, when I was asking to try a nasal stent, he prescribed me a nasal spray (Nesivine, oxymetazoline hydrochloride), that would open up my nasal passage, to check my theory. And it worked… It was unbelievable! My sleep quality improved significantly, my fatigue slowly started to disappear. But: it’s not a ‘gentle’ spray… you can only use it for a limited amount of time. So I used it for about two months, alternating 4 days of usage with 6 days of not using it (more or less). And the result was good, I was finally starting to recover and I was thinking about going back to work, on a part-time basis. But then the sleep quality went down again, the spray stopped working… This was a bad hit for me… I thought that I finally had a solution and it stopped working. The ENT had already suggested a permanent solution: another surgery, to widen my nasal passage by removing some flesh. But before doing another surgery, he first wanted to test something else: it seemed that the nasal spray stopped working at the moment when the pollen season began… He prescribed some anti-histamines, there was a slight improvement, but not significantly. So on 19th of July 2016 I got a ‘turbinectomy’, to widen my nasal passage. And, in short, it worked. My sleep quality has improved significantly, my fatigue issue is over. YES! During a last visit to my GP, when I was talking about my breathing, he noticed that I am breathing the wrong way… I used to have a ‘chest breathing’ (the ‘emergency support system’ according to my GP) and when trying an abdominal breathing, I also did it the wrong way… So he instructed me to do it the right way: first push all the air out of your lungs, just like you would push all the water out of a sponge and then relax to let the air flow in (I used to pull the air in and then relax to let the air flow out when I tried abdominal breathing). Now that I had the turbinectomy and I’m exercising the right abdominal breathing, things are changing fast… I still sleep 10 to 11 hours a night, but I feel ok when I get out of bed, which was not the case the past few years. And I don’t need to get some sleep in the afternoon… I hope my nights will get a bit shorter, so I can stay up a bit longer. But at this moment I’m already extremely happy that the fatigue issue was solved. Also a big change: my muscles are growing again. My arm muscles are certainly bigger, my legs are feeling different from before and are also more ‘solid’. With all the knowledge from the different examinations, all the pieces have fallen together: my breathing was insufficient, I didn’t get enough air in my lungs, which made my body go into the anaerobic metabolism, with the lactic acid as a ‘nasty’ by-product, preventing the regeneration of my muscles. There are two more things: a ‘nose dilator’ and good ‘nose hygiene’. Earlier this year I started testing a number of ‘nose dilators’, to physically keep my nose open during my sleep. The only one that worked, was from Mute Snoring. I’m still using that on a daily basis. And then there is good ‘nose hygiene’, to keep my nose ‘free’. Every day I use a nasal shower, once or twice. And I also use ointment and nasal drops (both from Rhinovita), as ‘maintenance’ for the nasal mucosa. By using these on a daily basis, my breathing is much easier and my energy levels are rising. And this, combined with the nose surgery, made me conquer my 4 year long fatigue issue. By definition I was a patient with chronic fatigue syndrome, but I found the cause, and I recoverred. Fortunately. PS (08/12/2016): it seems clear that my problem was air/oxygen related. Now that I have more air flow, my fatigue disappeared. But there is one thing that is weird: I never had a low SpO2-level in my blood… I bought a pulse oximeter to measure this and over a period of 30 days the levels were ok. Also in the sleep clinic, during the several surgeries and visits to the hospital my oxygen saturation level was always ok… So it seems that current medical technology is missing something, is missing another parameter… This seems something worth investigating. UPDATE 23/12/2016: the past few weeks I’ve met a number of people who have known me for some time, both personal (e.g. family) and professional. And they all said the same thing: that I’ve never looked this good. My skin color looks healthy (I used to look pale to very pale the past years), my eyes are shining again (they were rather dim the past two years). And I’m also feeling much better. How improbable it might seem, enlarging my nasal passage solved my fatigue issue. Could a limited air flow be the cause of chronical fatigue? It’s certainly worth investigating… I’m the proof that at least in some cases it is. UPDATE 02/01/2017: I just returned from a hiking trip on snowshoes, in the Alps (you can see the pictures here). A hiking trip that was rather strenuous: every day we had to overcome between 700 and 900 meters in altitude, with a backpack of 7 to 8 kg. That is not an easy ‘walk in the park’. But I did it, even without being exhausted. There were a few difficult moments, but compared to comparable trips the past decade, this time it was rather easy. Which is amazing: only a few months ago I was still on sick leave, physical efforts were a real problem, I ‘crashed’ on a regular basis. Half a year ago, I couldn’t even drive 1 hour with my car, now I drove the larger part of the 1000 km trip from Belgium to the Queyras region. It is amazing what the surgery, what the enlargement of my nasal passage and a correct breathing technique did to me. It really changed my life. I haven’t felt this good in a very, very long time. My physical condition hasn’t been like this in a decade, or even more. The air was rather dry in that part of the Alps, which resulted in very small bleedings in my nose and therefor lots of crusts in my nose. Which limited the air flow during my sleep and this was shown in the sleep tracking: the level of deep sleep went down significantly, the last night I even had no deep sleep at all… Once again the proof that my sleep quality and therefor energy level is linked to how ‘open’ my nasal passage is. Looking back at this 4,5 year ‘adventure’, I have to conclude one thing: doctors, medical experts are (often) missing the obvious, the need for a healthy breathing, a healthy oxygen intake. That’s where my fatigue issue started, that’s where it ended. My advice: when confronted with a chronic fatigue, start checking the breathing, the air flow through the nose. Apply a good nose hygiëne, keep your nose open during your sleep, e.g. by using a nose dilator. And for researchers: the oxygen saturation levels in my blood were (really) good, there is another parameter missing. Try to find it! 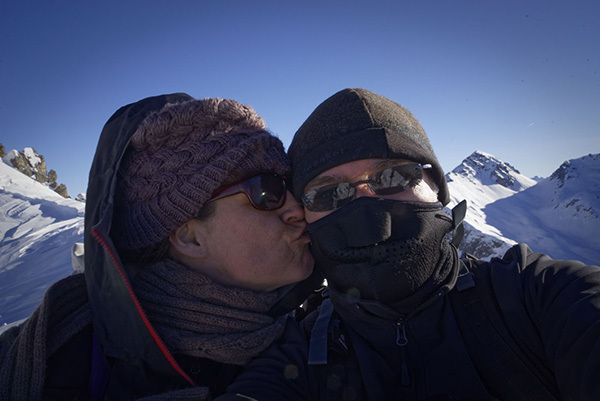 My girlfriend and me, at the Col de la Rousse (Arvieux), after a 900 m climb. This kind of hike wouldn’t have been possible a few months ago. UPDATE 18/01/2017: this morning I paid a visit to the old, wise doctor. And again I did the full arsenal of physical and lung tests. The results were what I expected: a strong improvement. Which was a pleasant surprise for the doctor. And he was very happy, with the result but also with the diagnosis which led to the surgery, the solution of my problem. Below is a graph with some important parameters from the tests. 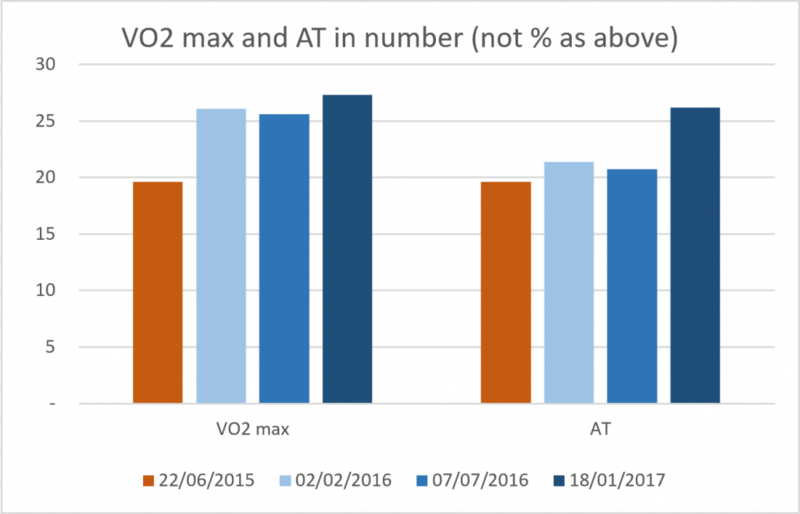 In the graph above, AT is a percentage of the measured VO2 max, which might be interpreted the wrong way. 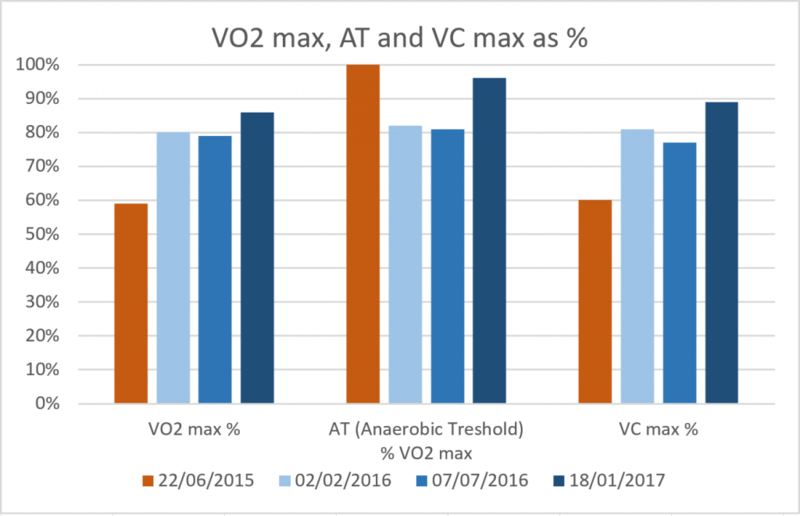 In this graph I mention the measured VO2 max values and I recalculated the % AT to the real number, which shows the real increase better. And with this, the final chapter of my fatigue problem has been written… Finally. 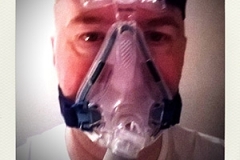 UPDATE 01/09/2017: a few weeks ago I started using a new type of CPAP mask. And what a difference that makes! Although the small surgery last year cured my fatigue issue, this new mask is again an improvement, I’ve never felt this refreshed in the morning. I’ve briefly tested a number of masks, but this one gives me the most air while breathing. And I guess it also has less air leaks while sleeping. The new type is Amara View from Philips. UPDATE 01/04/2018: the last month I’ve tested a new device, a headband, called Dreem, which analyzes your sleep in real time via EEG-sensors and boosts the deep sleep phase, via pink noise. I’ve tested a number of scenarios. The main conclusion: the sleep boost works. I have over 1 hour extra deep sleep, compared to a week without the sleep stimulation and I’m waking up half an hour earlier than before. Next to that: the Mute Snoring nasal dilator gives me about half an hour extra deep sleep. You can read the full review here. Buy a wearable, activity tracker or smart watch with a good sleep tracking. It should at least make a distinction between light and deep sleep, if it also detects REM sleep or gives a sleep quality figure, that’s a plus. Make sure that the data can be exported to a CSV or XLS-file! 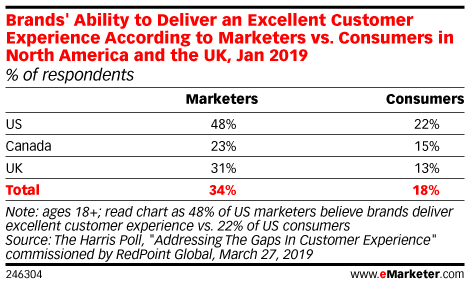 Some brands charge you a yearly fee for that… So do look at that upfront! There are already good wearables for around 100 euro. Keep a diary, preferably in Microsoft Excel (or a similar program). Enter each day the amount of sleep you got, including the different sleep phases (light sleep, deep sleep, if available REM sleep and/or sleep quality), each in a separate column. Enter the number of steps you made. And evaluate your energy level that day, on a scale from 0 (very bad) to 3 (fantastic). Also note other things that might be relevant, e.g. if you had a bad cold and a running nose, or e.g. a late dinner. Everything that might be relevant. Create graphs based on that data. A graph is much easier to interpret than just numbers. Based on those graphs you might detect trends: when do you feel better? When did you feel bad? This is an essential step! This is how I discovered that my fatigue was linked to my sleep quality (not illogic), and that my sleep quality was linked to how ‘open’ my nose was… If you aren’t that good with Excel, ask somebody in your neighborhood, e.g. your nerdy nephew. He will be happy to help you! If you think you have found a pattern, check this with your doctor, or even with multiple doctors. And check if this theory can be tested in some way, to prove whether it is valid or not. If your doctor immediately rejects your theory, go to another one! I was lucky that the ENT and the fatigue doctor both were open to a new theory, but this isn’t always the case… A decade ago I visited a migraine specialist a few times. He immediately rejected my list of possible triggers, he had never heard of that kind of triggers! Impossible! But a few years later, when there was a big migraine conference, he was interviewed on TV and he told about the new discoveries that were being discussed at the conference, among which new triggers. The new triggers he mentioned was exactly my list… So don’t just give up when a doctor immediately rejects your theory! Insist and ask how your theory could be tested. It is thanks to these action items that I found the cause of my fatigue, the final solution came from the ENT. Hopefully you can find the cause of your fatigue with these action points. Success!!! 8 Comments on "My 4 year long fatigue issue – and how I recoverred"
Thank you for sharing your insight on the septoplasty procedure. I appreciate the information from someone with firsthand experience. Thanks for your comment! And you’re welcome! Fatigue issues, apnea, breathing don’t get enough attention… so I’m happy to share my experiences. Hi Marvin, be patient… 🙂 If you refer to the turbinectomy, I really started to feel the effect after about 4 to 6 weeks. And make sure that you keep your nose clean, that’s why the first week your sleep quality will be worse (btw: keeping your nose clean is a tip for the rest of your life). 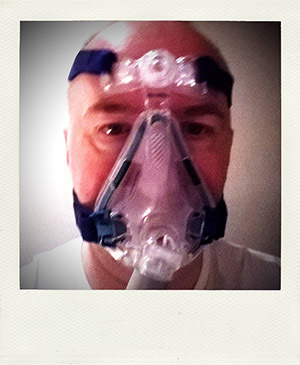 I’m still using my CPAP. But the last year I switched to a new mask, with a large improvement, and a two months ago to a new device, which was again an improvement. Do ask your doctor about other CPAP options! hi, I experienced fatigue for 3 months and had septoplasty and turbinectomy surgery 2 weeks ago. after that, I still experienced poor sleep and fatigue which was still as bad as before surgery. don’t expect miracles, it takes time… And it can depend from person to person. For the turbinectomy, did they actually remove your turbinates completely or just reduce their size (for example, by submucosal resection)? Too much removal of turbinates can actually make things worse (“empty nose syndrome”), but clearly you avoided that fate and ENTs are more conservative about operating on the turbinates than they were a few decades ago. Only the lower turbinates were removed. The middle and upper are still there.